When the Sands Cares Fresh Start Mobile Showers Powered by Clean the World began operations, we wanted to provide immediate relief and resources to those in need as part of our commitment to combatting homelessness. The Fresh Start Mobile Showers travel across the Las Vegas Valley, working together with several homeless services providers, offering showers five days a week. On its one year anniversary in July, the mobile hygiene unit had provided more than 7,500 showers to the homeless community. 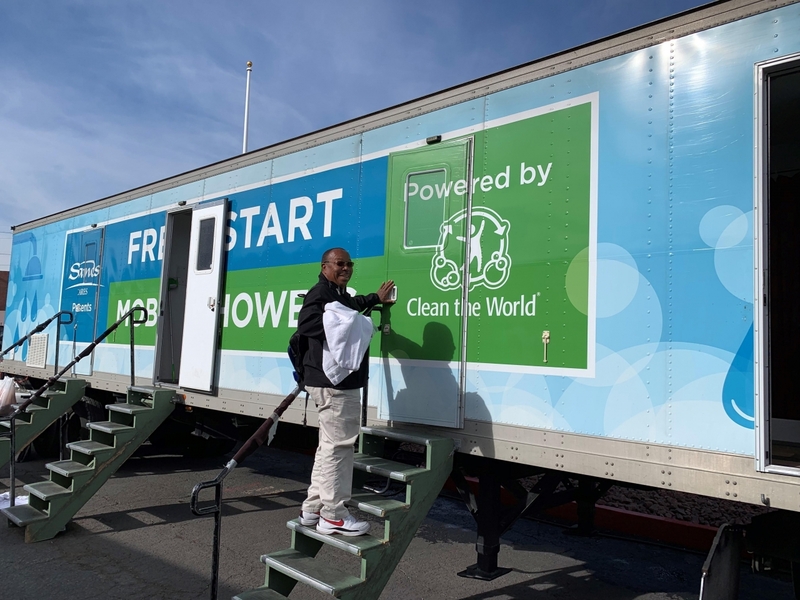 Now Sands Cares and Clean the World can announce that Fresh Start Mobile Showers provided its 10,000th shower! Michael Guillory, 58, first came upon the showers last September when he saw the truck parked on Foremaster Lane and walked up to find out more about it. For Michael, the showers have helped him tremendously, including the team who runs it—Kevin Williams and Jameel Milligan. Recently, Michael went for an interview at a local restaurant and was able to take a shower in preparation for it. Michael was the mobile hygiene unit’s 10,000th shower recipient and was proud to report that he had finally gotten the job opportunity he was waiting for. Learn more about Sands Cares and their work to end homelessness.